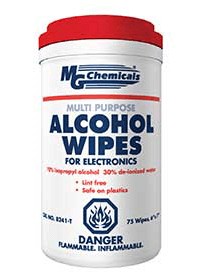 General all-purpose low lint 70/30 Isopropyl Alcohol blend pre-saturated wipes. Safe on plastics. Made from a blend of polyester and woodpulp they are strong and durable. This product is compliant with food safety regulations in Canada (CFIA) and Internationally (NSF) making it the ideal cleaner and disinfectant for use in and around food processing establishments. Offered in a convenient tub dispenses the wipes remain wet and effective when the sealed cover stays in place.